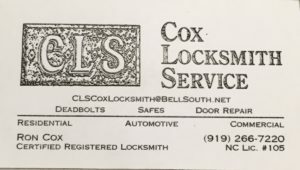 Hello and welcome to the new CLS Cox Locksmith Website: www.clscoxlocksmith.com. We have just launched. We have a new logo. We have our business name and kept our CLS brand. We now have a “key” as our core image next to our business name. But we want you to know, we aren’t quite finished with everything yet! We are going to be uploading headshots of all of our staff member, photo shots from within our storefront and other images and content in the following day. Also, we starting our first “Key Information” newsletter for our customers. We want to thank www.morrisseo.com for building our new website! Check them out if you are considering a new website or ongoing hosting or digital marketing services. Please stay tuned for future updates and call us at 919-266-7220 with any questions you may have!